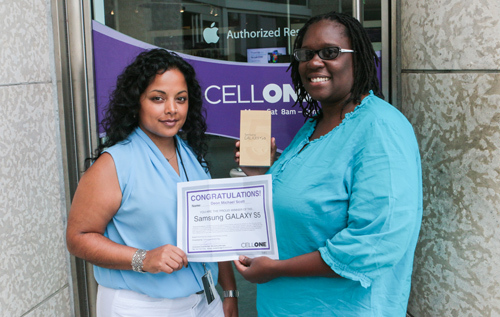 Patrice Scott (r) picks up a new Samsung Galaxy S5 smartphone from CellOne Marketing Manager Schereene Outerbridge. Patrice’s husband Deon Michael Scott won the prize in a Bermuda Sun/CellOne Augmented Reality contest that played out on Twitter earlier this month. Learn how to experience Augmented Reality on your own smartphone or tablet.